Six current and former employees of the National Abortion Federation told Rewire.News they experienced sexual harassment at the hands of NAF's security director. A few of the employees Rewire.News interviewed referred to a "whisper network" at NAF when it comes to sexual harassment that many of their peers claim to have experienced. UPDATE, June 22, 8:51 p.m.: The National Abortion Federation announced in an email to members Friday night that Mark Mellor is no longer security director at the organization. UPDATE, June 15, 7:30 a.m.: According to an email sent to National Abortion Federation members Thursday night, Mark Mellor has been suspended. In the summer of 2012, Katherine O’Connell was over the moon that she would be starting her first job out of college at the National Abortion Federation (NAF) in Washington, D.C., as a quality and operations assistant at NAF’s Hotline Fund. O’Connell, who was involved in reproductive rights activism in college, was especially excited to provide services to pregnant people at NAF, where she had interned in the past. NAF’s abortion fund is one of the largest in the country, and its hotline—which connects people who need abortions with financial resources and referrals—is one of the busiest. But in September 2013, NAF hired Mark Mellor to direct the nonprofit’s security program—a decision that would ultimately make the job untenable for O’Connell. Mellor, originally from Canada, came to NAF with an impressive security background. According to a legal declaration he submitted in a lawsuit on behalf of NAF in 2015, Mellor served from 2007 to 2013 as a private security guard for the late Vancouver physician and abortion provider Garson Romalis, who survived both a shooting and a stabbing by anti-abortion extremists in 1994 and 2000, respectively. (Romalis died in 2014 following an illness.) For many years, Mellor testified, he worked for a Canadian security firm, where he provided security for clients at high-profile events, including the host broadcasting network at the 2010 Olympic Winter Games in Vancouver. Additionally, O’Connell says that when Mellor was first hired, NAF employees were instructed to bring safety and security concerns to him. Within a couple of months of Mellor’s hiring, however, O’Connell started feeling uneasy at work. O’Connell began noticing behavior from Mellor that she characterized to Rewire.News as “sexual harassment.” She and others told Rewire.News that Mellor would leer at hotline staff and other staff members—many of them young women recently out of college—as they would walk by his office, which was originally located directly adjacent to the NAF Hotline Fund department. Once, she said, he tried to persuade her to move boxes into a storage area alone with him. “He put his hand on my shoulder and ran it down my back [and] side,” O’Connell wrote in October 2014 in notes about the incident, which she shared with Rewire.News. “I felt extremely uncomfortable and like he was trying to pressure me to be alone with him. I also felt that him touching me was unnecessary and inappropriate.” But she said she put her foot down and brought along another co-worker to help. O’Connell wasn’t alone. Twelve current and former employees described to Rewire.News experiencing, witnessing, or being told about similar behavior from Mellor, who is tasked with ensuring the safety and security of staff at member abortion clinics and providers throughout the United States and Canada. Six of these people say they directly had inappropriate or disturbing interactions with Mellor, while two say they personally witnessed troubling instances, and four say they heard about such conduct from multiple colleagues. NAF provides training and continuing medical education courses to members and evaluates member clinics for quality assurance. NAF also provides security assistance and training to members so they can protect their staff and patients from potential violent attacks. Thanks in part to decades of political rhetoric stigmatizing abortion and vilifying the doctors and health-care professionals in the field, abortion providers routinely face threats from anti-choice extremists. NAF annually tracks different incidents of death threats, hate speech, property destruction, and murders motivated by such ideology. Clinic security is a high priority at NAF, and Mellor’s role as security director makes him a prominent member of the staff. Connie*, another former NAF employee who asked not to be named in this story because she still works in the reproductive rights movement, told Rewire.News she once heard Mellor audibly grunt while ogling a female co-worker. She said he once remarked that her body was the same shape as his ex-girlfriend’s, a comment that made Connie feel distressed. Connie told Rewire.News that Mellor is a high-profile, well-regarded member of the reproductive rights movement, and seeing his behavior go noticed but uncorrected early on, she worried he would continue getting away with it regardless of whether she raised the issue. But O’Connell did decide to report what she was experiencing. As a survivor of a prior sexual assault, O’Connell says the behavior triggered her. At the time that she worked there with Mellor, the organization had no dedicated human resources department. After about eight weeks of experiencing what she described as sexual harassment from Mellor, O’Connell brought her concerns to another employee, who, O’Connell says, directed her to the organization’s general counsel, who was also its senior policy director. O’Connell says the general counsel encouraged O’Connell to come to her any time Mellor did something to make her feel uncomfortable. “I felt like after that—after she told me that I should come to her office and report it—I felt like I was in her office every week noting something that had happened, where he had put his hands on my waist or made other comments to me,” O’Connell said. She says the general counsel told her that the matter was being handled internally. However, O’Connell was never aware of any concrete disciplinary action against the security director; the general counsel never gave her an indication about whether any had been taken. O’Connell shared with Rewire.News a Google Chat conversation dated May 1, 2014, between herself and a former NAF co-worker, in which the former co-worker said she was also experiencing behavior from Mellor that made her uncomfortable at work. Both women were planning to leave the organization and were discussing what to write in their exit interviews and how to persuade management to address the issue. In that chat, O’Connell describes how much Mellor’s behavior was distressing her, and explains it would be the main reason for her departure. The former co-worker wrote that she was considering talking to her supervisor in her exit interview about Mellor’s actions. O’Connell officially left NAF in October 2014. In both her exit interview document and an additional letter to management—both of which she shared with Rewire.News—O’Connell cited the unaddressed issues with Mellor’s behavior as one of her primary reasons for leaving her job. In the letter, she adds: “This is not an issue I ever thought I would face at a women’s organization” (emphasis original). O’Connell told Rewire.News that she never received a response to this letter or the discussion of sexual harassment in her exit interview. Reid*, a former employee who asked not to be named, told Rewire.News that she experienced unwanted touching and comments from Mellor, behavior she characterized as sexual harassment. And there was one incident in particular that shocked her to the point she immediately reported it to her supervisor. Reid said she recalls that the woman’s head was not visible on the desktop background—that she was pulling down a bikini top and pushing her breasts together. She noted that the computer was aimed at an angle so the background was visible to anyone walking by Mellor’s office. Reid said she told her supervisor verbally and then emailed her about the incident, and that her supervisor informed the general counsel. (When asked, Reid said she no longer has access to this email.) As a result, Reid said, one of the few other male staffers in the office—but not Mellor’s direct supervisor—was sent over to Mellor’s office to ask him to change his computer background because it was offending others on staff. Reid, who shared a wall with Mellor, said she overheard the two men laughing about the situation. “It was changed, but it was seen as this giant joke,” she said. Reid quit shortly thereafter. The incident wasn’t the exclusive reason for her departure, she says, but it did play a part. “NAF’s refusal to deal with [Mellor’s behavior] was definitely a factor in why I thought it was a hostile work environment,” she said. Claire*, a former employee who asked not to be named because she still works in the reproductive justice field, told Rewire.News that one day at work, Mellor noticed her bra strap peeking out from her sleeveless dress and adjusted it for her, a move that Claire said was “inappropriate.” She described his general demeanor in the workplace as “somewhat creepy,” and said she did not believe that he appreciated the power dynamics between himself—a director of security, and one of the few men at the organization—and the younger, junior, mostly female employees he interacted with. Jane*, a current employee who asked not to be named for fear of retaliation, told Rewire.News that in 2015 Mellor made repeated and frequent comments that made her feel uncomfortable and offended to the point where she refuses to talk to him. Mellor, she said, is someone to whom she’s supposed to be able to bring safety and security concerns. Several of the current and former employees Rewire.News spoke with said they did not feel comfortable addressing security concerns at NAF directly with Mellor, either because he made them feel uncomfortable from firsthand experiences, or because he has a reputation in the office. Jane said that whenever Mellor would see her chatting with building staff, he would make “extremely inappropriate” and “unprofessional” comments, asking if she was going to go on dates with these individuals. She felt that the comments implied that she and the building workers were “in some sort of sexual relationship,” and she said they went on for months. Kathleen Heckert has been close friends with O’Connell since college. For the past few years, they’ve lived together just outside D.C. in Alexandria, Virginia, with Heckert’s then-boyfriend, now-husband. Heckert started working at NAF about six months after O’Connell had started there, just a few months before Mellor was hired. Like O’Connell, Heckert described Mellor’s behavior to Rewire.News as sexual harassment. She noticed him leering at the female staff and touching their shoulders. Heckert said she never felt personally targeted by the remarks. But she said hearing from O’Connell and some of her other colleagues, as well as witnessing firsthand the way he would look at and talk to certain co-workers, made her feel very uneasy around him. She noted that her job on the hotline was to treat pregnant people with compassion and sensitivity, which was directly at odds with how she and her co-workers felt they were being treated by their employer around this issue. Several other NAF employees echoed this sentiment to Rewire.News. They said they were frustrated by what they believe has been insufficient responses from management regarding issues of sexual harassment. And many said they were reluctant to talk to a reporter about their experiences because they worried about the repercussions on the reproductive rights movement and the work they’re doing. Shortly after O’Connell left and says she shared her experiences in writing with management, Heckert says that Mellor’s office was moved away from the hotline department to a different part of the office; the reasons for the move were not made explicit. Other former and current employees corroborated this with Rewire.News. But, they say, the move did not do much to change Mellor’s behavior or how he made his co-workers feel. “I can’t believe he still holds a job there,” she added. 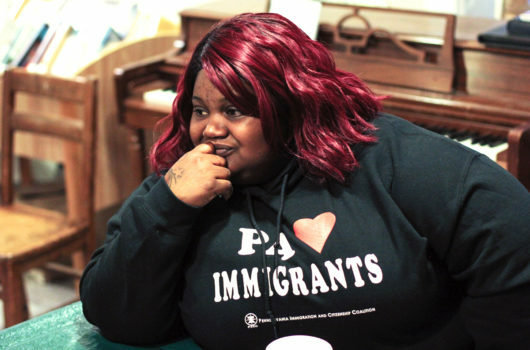 Faith*, who currently works at NAF but asked not to be named for fear of losing her job, told Rewire.News that she believes management at NAF has willfully ignored some of the charges that have been brought to their attention. Part of the problem, Faith and others told Rewire.News, is that NAF has lacked a consistent, in-house human resources department. One existed between the fall of 2016 and January of this year, but both the HR director and her assistant quit. Currently, NAF is hiring for these positions as well as a slew of others. Jane said this is one of the reasons she did not report the comments from Mellor that were making her uncomfortable. Kelly agreed with this sentiment. “There’s no real way to report things or to follow up,” Kelly said. As a result of various grievances, employees of NAF’s Hotline Fund have started the process of forming a union. In the meantime, employees have started speaking up about their dissatisfaction with what they describe as a hostile work environment on places like Glassdoor, where employees can review their workplace, and the ReproJobs Facebook page, where employers can post openings for positions in reproductive justice organizations. In these online spaces, former employees, O’Connell among them, have mentioned being sexually harassed while working at NAF. Several current and former employees also told Rewire.News that high turnover at NAF has been the rule rather than the exception for years now, which they believe is a result of several factors, including dismissive reactions to complaints about inappropriate behavior. Faith told Rewire.News that at a recent meeting with management to address employees’ reasons for wanting to unionize, Saporta denied knowing about sexual harassment claims against staff members, something Faith and others say they do not believe to be true. Faith noted that NAF has scheduled a sexual harassment training for this week. Saporta did not respond to questions regarding her alleged comments about not being aware of harassment prior to this recent meeting. Mellor did not respond to requests for comment; NAF did not respond to direct questions about allegations against Mellor. However, Saporta told Rewire.News in a written statement that NAF takes sexual harassment issues seriously and believes it has handled all sexual harassment allegations that have been brought to management “appropriately, and consistently with the law and our policies.” She said that for the last two decades, NAF has had “at least one staff person who handled human resources as part of their responsibilities” and has used outside consultants to provide additional HR support as the organization grew. She confirmed the hiring of a senior director of human resources and a human resources coordinator in 2016 and is currently interviewing candidates to fill the senior director of HR position. “Sometimes employees bring complaints that do not rise to the level of violating our policy or the law. As a responsible employer, we cannot share specific details about personnel matters—including information about an employee’s performance or disciplinary actions taken against them—with other staff or non-employees. This can be frustrating for some staff and create the perception of inaction on our part, even when that is not the case,” Saporta continued. Saporta noted that NAF is currently updating its entire employee handbook, including policies surrounding harassment. Stephanie*, who also currently works at NAF and asked not to be named in this article, said she is interested in seeing how this sexual harassment training will be handled, and what it will accomplish. She told Rewire.News that she has not personally experienced harassment from Mellor but said she has been told about disturbing encounters with him from some of her co-workers. “I literally can’t believe that he’s still allowed to work there,” she said. A few of the employees Rewire.News interviewed referred to a “whisper network” at NAF when it comes to sexual harassment that many of their peers claim to have experienced. Both Farah* and Dionne*, who currently work at NAF, said peers pulled them aside individually when they started working at NAF and told to stay away from Mellor, though they noted that they have not experienced direct harassment from him. Both said there is an understood but unspoken policy that Mellor is supposed to stay away from the hotline department and not address hotline staff. Faith said she feels that the issues her co-workers have been dealing with ultimately affect the people they are trying to serve. The high turnover rate sometimes leads to a severely understaffed hotline, she said. Claire, who says that NAF is not the only national reproductive rights organization with workplace issues, agrees that how employees are treated at work does have a real-world impact on the people trying to access health care.